Our decades worth of hospitality experience in the Manuel Antonio-Quepos area means that we bring our guests the best possible vacation rental experience with the most convenience. The Jungle Vista Inn is proud to look back and celebrate its history. Originally known as El Paseo del Mar, our quaint, jungleside building complex was constructed by Charles Quinlan, a Manuel Antonio based painter who specialized in tropical themed subject matter. Upon viewing his work, it’s clear just how profoundly inspired he was by his rainforest surroundings, from the active wildlife to the exquisite plantlife. Quinlan further applied his artist’s touch to Paseo del Mar by handcrafting the building’s iconic wildlife friends that adorn its facade. The larger-than-life mosaic iguana and frog speak to the all-natural playfulness and artistry that Quinlan is known for. The hospitality team — the same team that brought Los Altos Resort to Manuel Antonio, Costa Rica — is proud to build upon the legacy left behind by Charles Quinlan. Our passion and respect for Manuel Antonio’s one-of-a-kind rainforest ecosystem guided us toward El Paseo del Mar, and our continued love and admiration for nature inspired us to redesign the building around these core values. 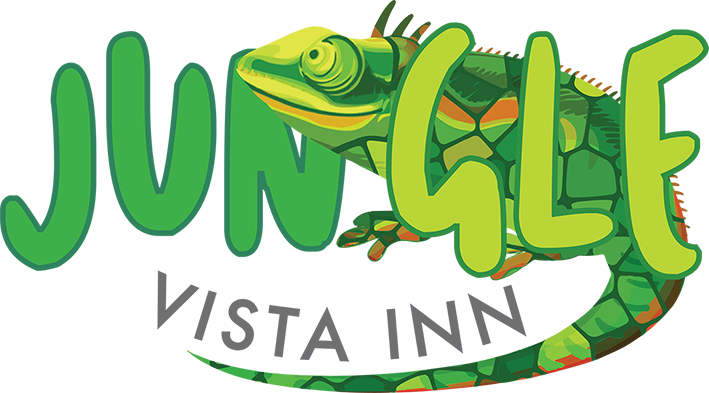 Our mission with Jungle Vista Inn is to create a nature-inspired home-away-from-home for visitors to Manuel Antonio. We understand that Manuel Antonio has become one of the world’s greatest eco-destinations, and with that in mind, we are committed to providing guests with every opportunity to experience the energy, vitality, and beauty of Costa Rica. Our artfully crafted vacation rentals reflect our desire to create a space in which guests feel the beauty of our natural surroundings inside and out. This means we placed an emphasis on furnishings that integrate with the space, not clutter. We also sought to foster within our Manuel Antonio vacation rentals the seamless flow of natural light as well as a direct connection to our natural surroundings. The balconies offer an ideal way to literally step outside and experience the rich sights, smells, and sounds of the Manuel Antonio rainforest. Additionally, our pool and patio provide an ideal space from which to kick back, relax, and admire the picturesque rainforest that surrounds our jungle hotel. Our guests ultimately love our jungleside Manuel Antonio hotel because of its extraordinary proximity to our natural surroundings as well as our central location to Manuel Antonio’s most attractive destinations. Our hotel is also located only a short walk away from our partner resort, Los Altos Resort. In addition to the wonderful amenities offered at Los Altos, we highly encourage our guests to explore the wonderful, awe-inspiring network of hiking trails that extend through Los Altos’ nature preserve. Our emphasis is, and will always remain, on offering our guests an unparalleled Costa Rican home-away-from-home experience. We can’t wait to host you on your upcoming trip to Manuel Antonio!